As a wholly owned subsidiary of the Arkansas Medical Society, AMS Benefits, Inc. is dedicated to providing comprehensive, quality insurance coverage for physicians, their families and their practices. 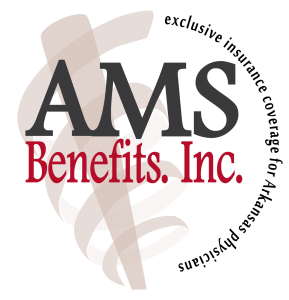 AMS Benefits was created by the Arkansas Medical Society over 20 years ago to work exclusively with Arkansas physicians to provide a convenient source for all of your insurance needs. Our staff consists of Agent and Administrator, Alanna Scheffer ; Producer, Travis Mulhearn; Producer, Alan White; and Agent and Administrative Assistant, Emily Clark. Together, we work toward the goals of AMS and its physician members, who are truly the only customers we serve. We focus on solving problems and being there when you need us, not merely “selling” you a product. Our ability to be a comprehensive provider has been a huge advantage to physicians and clinic managers across the state. We represent several large clinics, but many physician members are in small practices with unique needs and we provide support for them as well. We support all AMS activities and physicians specialties and will do what’s best for our clients at all points. We know how busy you are and try not to ever over-solicit you and your staff. If you need us, please contact us anytime through the information below and we’d be happy to help.